York Fine Arts is proud to now represent the British marine artist Andrew Stranack-Wilson. Andrew’s paintings can be found in private collections on both sides of the Atlantic and on the American super-yacht Excellence III. 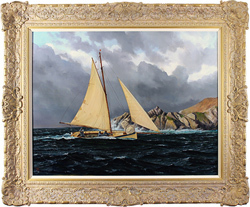 He has had successful shows at Mystic Seaport Gallery in the USA and the Royal Society of Marine Artists, UK, and his reputation is growing fast around the world. He was the official artist to the fateful Team Phillips challenge for The Race and will be working with the UK challenge for The Americas Cup. Read the full Andrew Stranack Walton biography.